Renting swimwear at Szechenyi Baths is an option for those who do not wish to carry around their swimsuits, swimming trunks, bikinis neither before taking a bath in the thermal bath, nor after that, when the swimwear gets wet and heavier. Some tourists assume that people swim naked in Szechenyi Baths. Quite the contrary, the Szechenyi Bath Dress Code makes wearing a decent swimwear compulsory for all, all days. Note: as the deposit is set higher, at HUF 3,000, which you will get back after your visit to the Szechenyi Bath, some tourists do not have enough money with them for the swimming suits rental. Please make sure you let the cashier know about your intention of renting a swimsuit BEFORE entering the bath, as the local spots, rental counters within the bath complex are not equipped with card payment tools. Inside the bath you can only pay by cash, but at the cashiers you can pay by card. Related questions: Can I wear a Speedo at Szechenyi Baths? Previous Can you Leave the Bag in the Cabin in Szechenyi Baths? Two comments I have are that, I wonder how long is an average length of time for a visit, considering check in time, even if your bookings are done ahead? And, I previously read somewhere that Szechenyi Baths sells swimwear, and I don’t see that information suggested here at the website. I wondered if it is so. Hello Karen, the visits range from a full day visit from about 12 pm to 9 pm, or 10 am to 7 pm, to shorter visits from 5 pm to 10 pm. Some guests only come because of the massage therapy, others only dip in for 2-4 hours. It really varies depending on interests and the general length of Budapest holidays. Locals tend to come at their usual hours, while tourists can come any time for a longer or a short visit. The bath is open from 6 am to 10 pm, so there is a wide range of visit patterns. Swimwear is not sold by Szechenyi Baths (rental is available), but there are some private vendors who sell swim wear on the spot. As a tourist who want to rent swimming suit, we dont have so much cash florins. Is it possible we pay the deposit in euros? unfortunately, it is not possible to pay the deposit in Euros. The swimwear rental costs HUF 2000 (deposit HUF 2,000/ appr. EUR 7). Have a nice time at Szechenyi Baths! What size ladies’ swimsuits do you have available to rent? there are swimming costumes for ladies from S to XL sizes (only swimsuits and no bikinis). 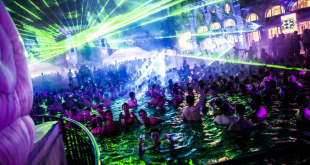 The swimming dresses can be rented for HUF 2,000 (deposit HUF 2,000), please be advised that the rental facility accepts only Hungarian Forints (HUF) in cash. Thank you! What size exactly is an XL? the XL size is around 42-44 (EU) or 14-16 (UK). Hi it says that the rental is HUF 1000 on the article below? Is it 1000 or 2000? I wish to visit tomorrow and is it likely that the particular swimsuit sizes are sold out? And how much is the rental for men? the rental is HUF 1,000 and you need to pay for a deposit of HUF 2,500, which you will get back after your visit to the Szechenyi Baths. Enjoy your time in the Baths! do you rent tankinis too? or just one piece suits? there are only one-piece swimsuits available for HUF 2,000 (deposit HUF 2,000). Please note that the rental facility accepts only Hungarian Forints (HUF) in cash. How clean/sanitary are the rented bathing suits? the swimming costumes are cleaned and sanitized according to the regulations. Hope we can welcome you at Szecheni Spa Baths! Rental wear is good idea but every one have to buy his/her own beach dress.